I Venti D’Azzurro 30 Anniversary Party! 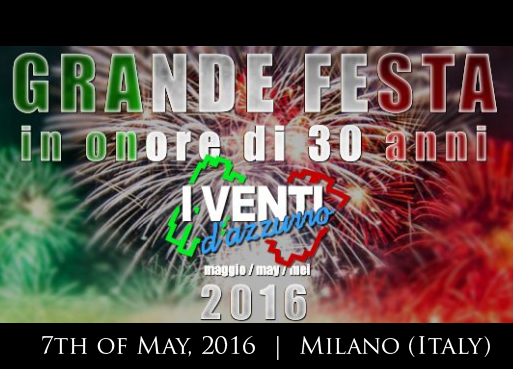 At the 7th of May next I Venti D’Azzurro will celebrate 30 year anniversary in Milan, Italy. Will you take part at this fantastic party? It will be a party similair to the Mantova Party in 2006. There will be a lot of singers, composers, producers, record companies…..and YOU!!! A few names: Aleph, Fred Ventura, Legend, Albert One, Linda Jo Rizzo (Flirts) and many more names to follow.